Canada search for Franklin expedition: Nationalism and control of Northwest Passage. An archaeological quest to promote Canadian exceptionalism and rule the Northwest Passage. The large display case in Centre Block 307-S, the Canadian prime minister’s office, is reserved for objects dear to the nation’s history and culture. The current leader, Stephen Harper, personally chose a handful of relics to display during his term in office. They are related to one of the darkest chapters in 19th-century exploration: the Franklin expedition, a British naval voyage to find the Northwest Passage. In the case lies a battered food tin with traces of red paint and lead solder oozing from its rim. A tattered label from a can of ox-cheek soup instructs diners to open it with a hatchet. A fragment of wood planking may have come from one of the expedition’s two lost ships. The Erebus’ equipment included a daguerreotype camera. 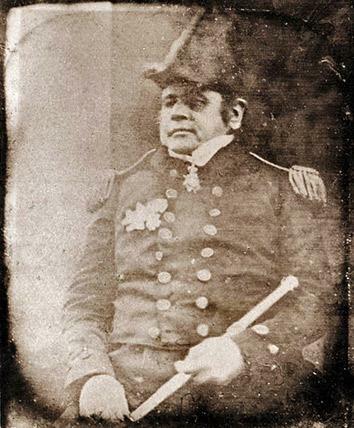 This photograph of Sir John Franklin was taken aboard the Erebus before it departed England in May 1845. It seems like an odd collection of stuff until you understand the enduring mystery of the Franklin expedition—and its unexpected significance for Canadian geopolitics in the 21st century. For hundreds of years, the British Admiralty had been dispatching expeditions to search for a geographic chimera, the Northwest Passage linking Europe and the Pacific by a navigable route over the top of North America. Some voyages were more successful than others, but none was able to push through hundreds of square miles of pack ice from Baffin Bay to the Bering Strait. Despite having almost nothing to show for the expeditions except nautical charts revealing where the Northwest Passage was not, the Admiralty kept the dream alive. Claiming the Northwest Passage became a matter of national pride for Victorian England. In 1845, the Admiralty outfitted its most sophisticated expedition to date. It chose naval officer Sir John Franklin to command the voyage, even though some criticized Franklin’s age (59) and physical fitness (lacking). The ships HMS Erebus and HMS Terror, freshly returned from a four-year mission to Antarctica, had proven their ice-worthiness. They were fitted with locomotive steam engines and screw propellers to breeze across open water. Every modern technology was provided for the expedition’s crew of 134: a library of at least 1,200 books, a daguerreotype camera, one mechanical hand-organ per ship, three years’ worth of canned food (a recent invention), steam-heating systems to keep both vessels toasty, and even a pet monkey. Their mission: Chart the last unexplored area of the Canadian archipelago for a likely route to the Bering Strait. They were to voyage via Lancaster Sound and Barrow Strait, filling in the final blank space on the Arctic map. What could possibly go wrong? After leaving London, Franklin’s party stopped at a Greenland whaling post to collect supplies and discharge five sick crew members before heading into Baffin Bay. Two passing whalers hailed them on July 26, 1845. Then the Erebus and Terror vanished. It wasn’t uncommon for Arctic voyages to last two or three years without communication home, but by 1847, the Admiralty was getting worried. The government sent a series of search-and-rescue operations, but no trace of the Franklin expedition was found until 1854. That’s when the world learned the horrifying truth. 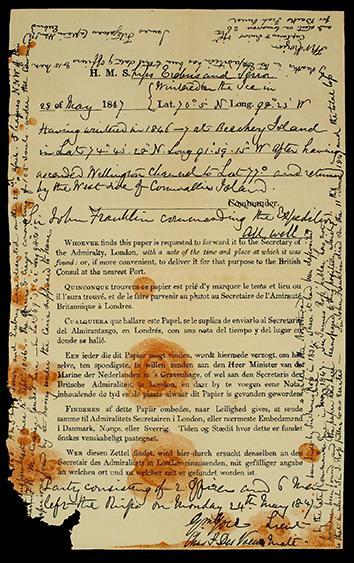 The single written document ever found relating to the fate of the Franklin expedition. The sheet of naval stationary bears a handwritten note from 1847 indicating that the men are “all well.” An addendum written in 1848 describes Franklin’s death, the ships’ permanent besetment in the ice, and the crew’s impending march to the mainland. The combination of heroism and horror has kept the Franklin mystery alive for generations. Many questions remain unanswered: Where did the ships finally sink? Where is Franklin buried? What happened to the ship’s logs and journals? Why did the survivors march south instead of north, where search parties were already looking for them? For Canadian researchers and their Franklinophile-in-chief, Stephen Harper, the truth may still be out there. The British government transferred sovereignty of the Arctic islands to Canada in 1880 and its rights to the expedition’s artifacts decades ago. The Canadian government designated the Erebus and Terror as national historic sites, even though their locations are unknown. Since 2008, Parks Canada has sent teams to the wind-scarred gravel shore of King William Island to look for clues. The flat, treeless land has become ground zero for archaeologists and amateur sleuths every August—the brief research window the Inuit locals call “Franklin season.” Using sophisticated side-scan sonar and underwater remote-operated vehicles, archaeologists have searched the seabed for evidence of the ships and ruled out square kilometers that yielded nothing. Teams on land, together with Inuit guides, have combed the pebbly shores for clues to Franklin’s final resting place. They’ve found fragments of clay pipe stems, discarded food tins, a Victorian toothbrush, and a lot of unidentified human bones. In August 2012, Harper personally unveiled a new research vessel and equipment to investigate wide swaths of the sea floor around Adelaide Peninsula and the tiny speck of O’Reilly Island, where currents and ice flow may have pushed the wreckage of the Erebus and Terror from the point where they were beset in 1846. “The modern age abhors a mystery; mysteries must be resolved,” Harper told the Toronto Star. Another expedition is planned to the area this summer. But something beyond the so-far fruitless investigation is prompting the government’s intense focus on the Arctic. Thanks to our warming climate, the Northwest Passage is now quite real and is open to more ships for longer periods in summer. Melting sea ice also reveals the possibility of offshore drilling for oil and natural gas. Disappearing glaciers uncover million-year-old deposits of precious metals just waiting to be mined. 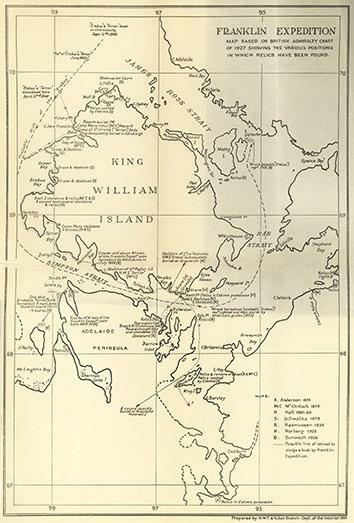 This map of King William Island shows the likely route taken by Franklin expedition crew members after abandoning ship in 1848. Discoveries by search parties in the 19th and 20th centuries are also indicated. Harper, a Conservative, and his administration have ramped up the Franklin search even while cutting much of the funding to Parks Canada. The team poking around King William Island each year represents most of Parks Canada’s remaining archaeological staff, according to Franklin expert Russell Potter, who maintains the blog Visions of the North. Some sense Harper is using the search for the Erebus and Terror as a stealthy way to exercise Canada’s sovereignty over Arctic waters and to protect them from American, Russian, and Chinese interests in shipping and energy development. Every year, Harper travels to remote settlements in Yukon, the Northwest Territories, and Nunavut to emphasize the importance of defending Canada’s claim to the land and waterways of the Arctic archipelago. The trips are a conscious effort to bring Canadians from all provinces together as one and create a stronger case for Canada’s claim on the Northwest Passage as a matter of national interest. In fact, says John Higginbotham, senior fellow at the Centre for International Governance Innovation in Waterloo, Ontario, and an expert in Arctic politics, the Franklin search is part of a larger agenda to promote a nationalist view of Canadian history. Americans may think it strange that Harper sees a key way to increase support for tough northern defenses in finding missing ships or their captain, confirmed dead 167 years ago. Why not just send a military unit up there, maybe a few drones to keep an eye on things? But then we’d be missing the meaningful link between the ill-starred disaster and the birth of Canada itself. “Conservatives want to rewrite Canada’s national myths,” says political journalist John Ibbitson, a senior fellow at the Centre for International Governance Innovation. They look to the far North as a place where the Conservative Party values of patriotism, heroism, toughness, and adaptation to the land and sea all come together—and Franklin fits in with that narrative perfectly. Harper envisions the far North not as a wintry and sparsely populated wasteland, but as the romantic birthplace of the nation, while the government-backed searches recast the Franklin expedition as a valiant example of Canadian principles instead of a gruesome catastrophe. John Geiger, chief executive officer of the Royal Canadian Geographical Society and co-author of the best-seller Frozen in Time: The Fate of the Franklin Expedition, agrees that the searches dovetail with the Harper administration’s efforts to resurrect a sense of Canadian exceptionalism. Confederation of Canada’s provinces and territories took place in 1867; the Franklin expedition, though British in origin, is one of the foundational stories of Canada’s emergence as an independent country. Canadians don’t have a revolutionary war to associate with the dawn of their nation—so the Franklin mystery steps into that role. “Things don’t simply disappear. The ships, even if they’re just remnants, may offer more insight into the debate over lead poisoning or the food supply. We won’t ever have everything from the expedition—no Franklin, no journals, very few remains from the crew members themselves. It’s the one piece of our history that will never be sorted out, and that is its appeal,” Geiger says. Discovery of the ships will provide a great sense of exhilaration, but perhaps a letdown, as well, for those in the throes of Franklin fever. The prime minister’s staff recently swapped out the Franklin expedition relics from Centre Block 307-S. The weather-beaten food tins and bits of wood will be returned to their respective museums. But that doesn’t mean the search for Franklin is over.